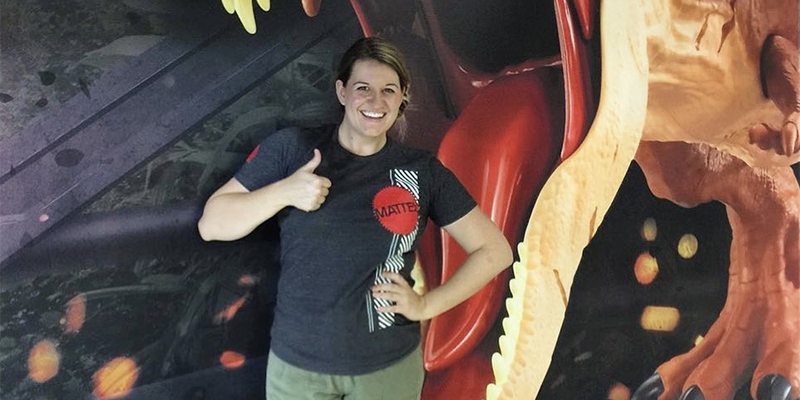 If you’ve been closely following Mattel’s Jurassic World toy community since the figures first hit last summer, you undoubtedly know of Britt Shotts. Acting as the Jurassic World Marketing Manager for Mattel during the development and release of their award-winning toyline, Britt has not only been instrumental in breathing life back into Jurassic collecting but has also has served as a legendary brand stalwart along the way. That that kind of dedication and passion evidently hasn’t gone unnoticed, as Britt announced yesterday that she is moving on from the Jurassic World team to hopefully bigger and better opportunities. This is definitely bittersweet news for the collecting community, as her sneak peeks and insight into Mattel’s plans for the toyline were unprecedented in the toy collecting community even outside of Jurassic. Personally, Britt has been immensely supportive of our mission here on Collect Jurassic and I was fortunate enough to talk toys with her on a few occasions. It goes without saying that she will be missed. Please join Collect Jurassic in wishing Britt the best luck on her future endeavors, as well as a huge thank you for her contributions to Jurassic toy collecting!